The Fed hike is most likely destined to clash with President Trump at some point in the future. Trump has described the US economy as a “mess” in sharp contrast to the Fed’s “confidence in the path of the economy.” Trump’s proposed tax cuts, stimulus programs, deregulation, and potential trade wars are viewed by some as potentially inflationary. One is preaching “restraint” while the other is touting “stimulus.” The Fed appears to want to “nip” any inflationary pressures early. For most of the 20th century, the debt ceiling was raised with few problems. Starting in 1995, that situation changed. In 1995, the debt ceiling increase debate became rancorous and led to the non-passage of the US budget and shutdown of government in 1995–1996. The impasse was eventually broken and the debt ceiling hiked. Debt ceiling increases continued over the ensuing years until 2011 when another crisis broke out. The rise of the Republican Tea Party and its objections over anything that President Obama brought forward resulted in an impasse. The markets reacted negatively and the US’s credit was downgraded. That brought the parties to the table and the impasse was eventually broken. Another crisis threatened to break out when the debt ceiling expired again at the end of 2012. When it became clear that failure to gain an agreement could cause a severe economic contraction, the debt ceiling was eventually hiked, and an agreement was in place to allow auto adjustments to cover payments. The auto adjustments ended on March 15, 2015 and the debt limit was suspended through March 15, 2017. The debt ceiling crisis of 2011 sparked a huge rally in gold of almost $400, starting in July 2011. The market topped in September 2011 at $1,923. Once the crisis was resolved gold came off and with at least some semblance of debt ceiling agreements in 2012 through 2015, gold eventually lost about $900 from the September 2011 top. That wasn’t the only reason gold prices fell, but it was a factor. The question is—are we on the verge of another debt ceiling crisis that could result in a sharp rally for gold? The debt limit needs to be raised to at least $20 trillion just to cover the debt outstanding today. US national debt today stands at roughly $19.9 trillion and could reach $20 trillion by year-end or in 2018. The national debt is expected to rise to over $22 trillion by 2021. The US Treasury burns through roughly $2 billion/day. Net redemptions of existing debt are around $100 billion a month. The trouble is the votes to raise the debt limit may not be there. The Tea Party Republicans remain adamant about going along with debt ceiling increases. No one wants to reach a point where the US might actually default. But that date could come as early as August 2017 as the Treasury burns through cash and payments come due. Gold prices have gone up with the debt limit over the years. It may be coincidental but it may also be message that the US$ is backed by nothing more than a promise on the part of the US government to pay the bearer of the note. That is the classic definition of a fiat currency. From 1970 when the world came off the gold standard to around 1990, gold prices for the most part had gone up faster than the debt. 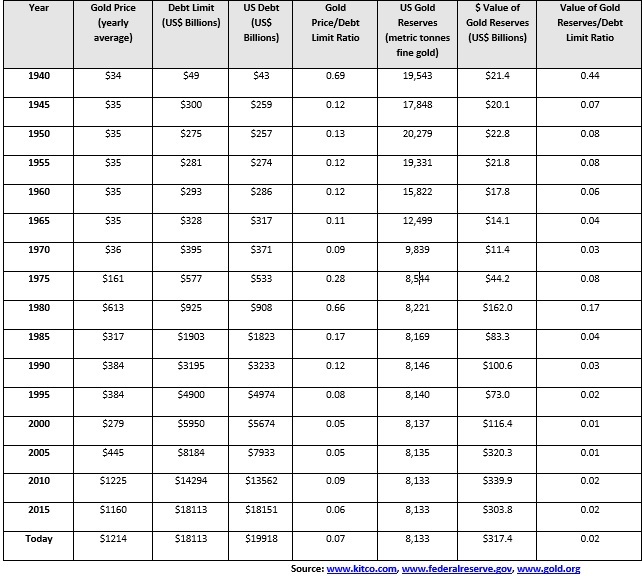 During gold’s long bear market the debt started rising faster than gold prices. Gold prices didn’t catch up and rise faster than the debt again until 2011. It was short-lived as by 2012 gold prices were falling even as the debt kept on rising. Over the years, the ratio of gold prices to the debt limit kept on falling. The chart below shows this relationship. 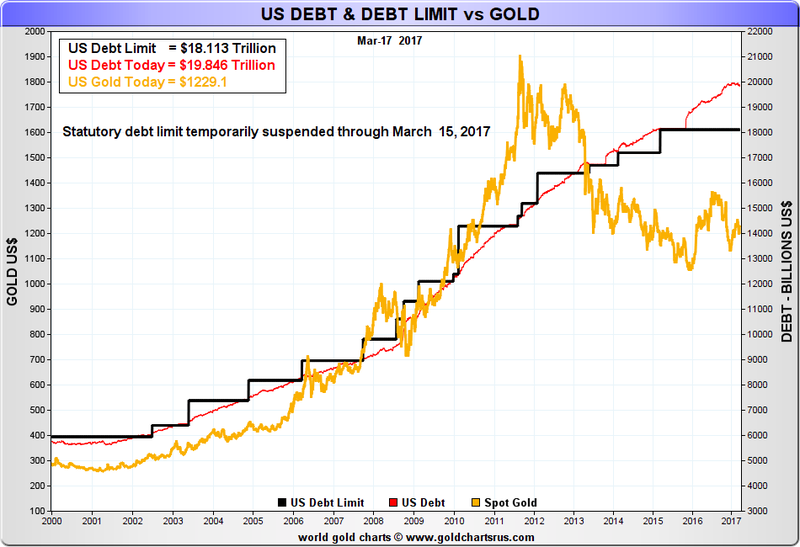 The average of the gold price/debt limit has been around 0.11 if one eliminates the two high readings seen in 1940 and 1980. For gold to return to that average, gold prices would need to rise to $2,200 with a debt ceiling of $20 trillion. The last time the gold price/debt limit was at 0.11 was in 2011 when it hit 0.12 at the September 2011 high. US gold reserves have fallen sharply from the war years. They peaked at over 20,000 metric tonnes in 1950. Today US gold reserves sit at 8,133 metric tonnes. These are still the world’s largest reserve holdings. We looked at the ratio of the value of the gold reserves to the debt limit and over the years. The average was about 0.04. Again, this sets aside the high readings of 1940 and 1980. The current ratio is just under 0.02. To obtain a reading of 0.04 against a debt ceiling of $20 trillion, gold prices would need to rise to at least $3,100. Since 1970 when President Nixon took the world off the gold standard, gold prices have increased by over 3,200%. The US national debt has increased by over 5,200%. For comparison’s sake, the Dow Jones Industrials (DJI) is up only 2,300% in the same period and US GDP has grown only about 1,800%. Debt has grown faster than GDP reflecting the need for debt in order to generate additional GDP. As well overall, gold prices have increased more than the DJI underscoring the importance of holding gold as part of an investment strategy. In measuring the price of gold against the debt limit or the value of the US’s gold reserves vs. the debt limit, the price of gold appears to be undervalued. The rise of the national debt and the gold price are intertwined and the gold price has fallen behind. A huge catch-up may be on the horizon given issues over the debt limit and the Fed and the President potentially on a collision course.